A significant tool for data processing is the audiovisual collection of the Historical Archive, which comprises photographs, audio and video recordings. Its utilization contributes positively to comparative research and the multifaceted interpretation of historical phenomena. 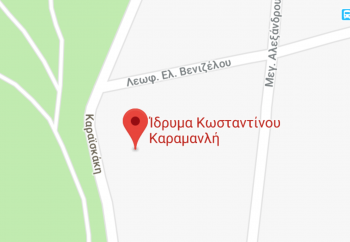 Τhe combination of sound and image is particularly effective, projecting on the one hand the political activity and the personality of Κ. Karamanlis and on the other the political events contemporary with the lengthy period in which he himself was the protagonist. These data constitute the most comprehensive recomposition of the general picture presented by postwar Greece, also making available data related to international affairs. The collection is recorded on 16 and 25 inch visual film and on 375 BETA, UMATIC and VHS video cassettes, digitalized on 375 DVDs. Detailed catalogues and information relating to the total audiovisual material is accessible by researchers in the Foundation’s reading room as well as from its Website, in accordance with the regulations of the Historical Archive.